We like to travel to the most cosmopolitan countries in the Middle East. 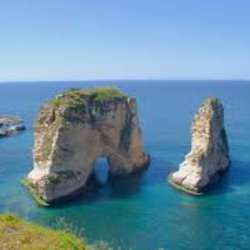 We planned a very detailed, but short, Fun and Adventures trip for you to discover Lebanon. You will only need to take the Friday off and maybe some morning hours on Monday. Lebanon is a country with a long and rich history. Phoenician, Egyptian, Greek, Persian, Roman, Arab, Crusader, and Ottoman ruins are scattered about the country and the most important of them are easily accessible. Byblos, Beirut, Tyre and Sidon are among the oldest continuously populated cities in the world. There are Roman baths in Beirut, as well as the Cardio Maximus - to name a few.) There are a lot of ancient mosques, synagogues, and churches in Lebanon. Lebanon is known for its Nightlife & Cuisine. In Protected content broke the Guiness World Records for the longest continuous party at 56 hours and previously for the largest bowl of tabbouleh & hummus, largest serving of falafel, longest mankoushe and much more. The UNESCO-recognized Roman archaeological site known as Heliopolis (City of Sun). In Jupiter Temple, only six columns remain out of the 54 giant columns that originally surrounded the sanctuary. The temple was built over a Phoenician podium dating from around Protected content . The city of Baalbeck has major remains from Islamic times including the Grand Mosque built by Omayyad Caliphs, with material borrowed from ancient monuments, and Mamluk mosque. Encompasses Protected content , is a rich agricultural area with gorgeous vineyards and orchards. It remains one of the rare places in Lebanon with well-conserved and much varied woodlands and wildlife. Nominated for the new Seven Natural Wonders of the World. It is 2million years old and one of the most impressive and interesting natural sites in the world. One of the oldest towns in the world. It was once a port city with many remains, cute narrow streets. Great restaurants and cafes. It was in Byblos where the first linear alphabet was found, ancestor of all modern alphabet. Historical Walking Tour of the city and free time in the afternoon. Monday around 4:30am, we head to the airport for our Pegasus 6:40am flight PC863. We arrive to SAW at 8:30am. Double Shared Room (king size bed or two single beds): US$420 per person plus US$160 Pegasus round trip (during promotion US$120, gotta catch it!). Single Room: US$700 per person plus US$160 Pegasus round trip (during promotion US$120, gotta catch it! ).